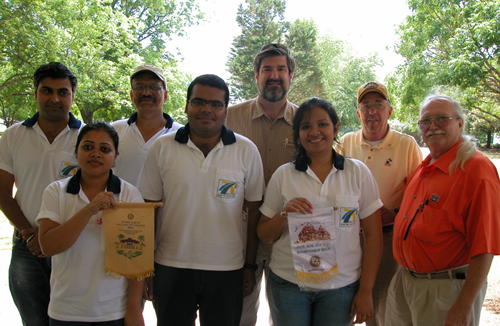 Auburn Rotary Club attempts to host a Group Study Exchange (GSE) team each year. The team is able to stay with a host Rotary family and learn our way of life while sharing with the club about their own. GSE is Rotary Foundation's program. GSE experiences offer unique cultural and vocational exchange opportunities for young business and professional men and women between the ages of 25 and 40 and in the early years of their professional lives. The program provides travel grants for teams to exchange visits between paired areas in different countries. For four to six weeks, team members experience the host country's institutions and ways of life, observe their own vocations as practiced abroad, develop personal and professional relationships, and exchange ideas. Because of its proximity to Auburn University and the vast international cultures represented among the university's undergraduate and graduate students, the Auburn Rotary Club works with AU's Office of International Education on a number of efforts. Among its collaboration efforts, Auburn Rotary provides annual support for the university's annual World's Fair, which celebrates the diverse world cultures represented on campus—not that different from the diversity Rotary Clubs internationally celebrate.